There is an 80:20 rule when it comes to writing online, and David Ogilvy put it so well when he said you should spend 80% of your time focusing on the headline. For each of these there are some rules and formulas which are universal. Make sure your headline is relevant to your audience and feels like it has been written for them. Consider using words that are specific to them like “The 3 mistakes hiring managers make when dealing with recruiters”. (By the way, negative headlines really capture people’s attention.) This will potentially reduce the volume of people interacting, but increase the relevancy of those interacting. And what matters more : volume or quality? Try answering questions you are being asked regularly. “How to …” is the most powerful term in digital marketing. Leading with this allows you to start solving business problems your targets may have. How timely is your content? Tie your headlines to something that is happening right now. This drives up the urgency in the reader. The downside is that the content won’t be evergreen so you may not be able to keep coming back to it. Use tools! Check out Adestra and their subject line analysis tool. It allows you to see if the key words you are using are likely to boost or drop your open rates. Using this I can see that the key word “danger” in a subject line should increase clicks in my email. Short and sweet. It works for blogs, social media, emails. With email marketing it is crucial you have a short email subject line especially as nearly half of all emails are now read on mobiles. Drive action by using verbs. These doing words will help your audience start to take action themselves. Ask questions of your audience. They will be more likely to read and respond. Wouldn’t you? People click on titles, updates and emails with numbers In. Use them sparingly though as some people have become bored or listicles (articles made entirely of lists). That said they still have some of highest click through rates. Gary Vaynerchuk often harks back to 1997 when his wine business’ email open rate was 91%. Since then he says marketers have ruined that channel for all of us. Email open rates are no longer knocking on the door of 100% but we can’t say email marketing is dead. It still has a place to drive impact for businesses. Recently more and more marketers talk about the website visits and business outcomes that short email lists can generate compared to much larger Twitter followerships. People are falling back in love with email because the stats are positive. Seth Godin refers to permission marketing which has become the byword for modern marketing. Permission marketing is the privilege (not the right) of delivering anticipated, personal and relevant messages to people who actually want to get them. If someone gives their email address you have permission to contact them as long as you deliver on the promises made when you captured their details. Continue to be valuable and there should be no reason for someone to stop receiving your messages. When I graduated many moons ago I signed up to a job board specialising in graduate jobs. To this day I receive a weekly email with top graduate jobs… (I haven’t unsubscribed as I want to see how long this goes on for.) If this company had started sending me jobs from an affiliate job site featuring more relevant opportunities or recommended I signed up to another job board and charged per lead they would have generated revenue and at the same time been more valuable to me. As it stands they can do nothing for me, and I can do nothing for them. 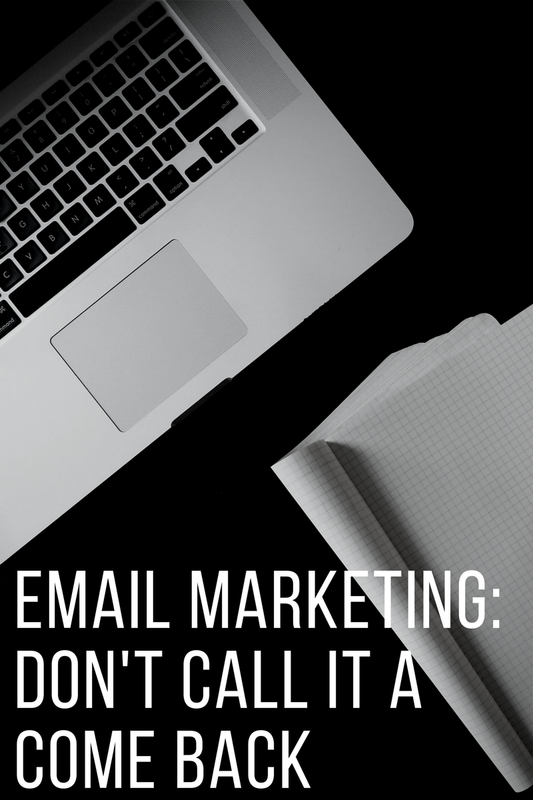 Email marketing hasn’t gone away so let’s not call this a come back. Take some time to reassess: are you still relevant and are you still delivering on the initial promise you made? Check the data and if you are, then the results should follow. Video is easily the fastest growing content type online. The problem recruitment companies face is that it feels expensive and hard to start. It doesn’t have to be though. What makes a good recruitment video? Attention. Grab your audience and stand out. This means being selective with the thumbnail you use, the cover image, the title and video description. Once you have your audiences’ attention it is about making sure the content is good quality to maintain interest through out the video. Story is crucial in maintaining attention but also delivering a message. Think about the structure of the content and narrative. If you are writing a script then edit in the same way you would a blog or article. Take out anything that isn’t essential. If you are looking for a simple framework to creating content check out this. Action. The next steps need to be considered when creating video. Ensure that you have something for your audience to do once they have watched your video – it might be to visit your website, share the video, check out a job or learn about your services. But it all sounds expensive. It doesn’t have to be. If you are outsourcing video creation to an agency there are businesses that can work to pretty much any budget. If you want to start out producing your own content because it is cheaper, you want more control or quicker turn around times then the good news is that it can super simple. In fact you can shoot HD video and edit it entirely for free using your iPhone. I would recommend investing in a tripod and a phone attachment. These vary in price from a £1 (from Poundland – no joke!) to £30 for a good tripod. If you can stretch the budget I’d recommend getting a DSLR camera as this will also take good photos that you will be able to use in other places like your website or for social media. Do make sure where you are filming is well lit. Aim for natural light, don’t put your subject in direct sunlight as it will wash out your picture. Do film in a quiet place with limited background noise. If you can’t avoid the background noise then try to be close to the subject or set up a second recording device and record an audio note. These two files can be merged when you edit. You can also buy an external mic to connect to your device. Do use your tripod. Nothing screams poor quality recording more than the jogging of a camera. Don’t film portrait. Have your phone horizontal unless you are doing something on Snapchat. Good luck and get shooting! Can you growth hack in recruitment? At least not in most traditional recruitment businesses. In recent times the term growth hacking has become mainstream having started with online businesses, apps and eCommerce websites. Here is why I don’t think you can growth hack recruitment. Growth hackers should start their approach at the product idea stage. In recruitment (and for that matter, others traditional service businesses) it isn’t really a product which can be manipulated, changed or optimised on the go. Growth hackers need to be able to change their product or service quickly based on live customer feedback and demand. Most traditional and established recruitment companies can’t pivot that fast or offer that many different services. What recruitment companies may be able to use growth hacking for include launching new industry / functional divisions, new business offerings (such as RPO) or additional services (especially if those services could be found online). Whilst it is unlikely that we will see real growth hackers in recruitment it is certainly important to understand what growth hackers are doing and how they operate. Most of the core principles of growth hacking boil down to good research, an ongoing understanding of the market, good digital marketing and an ability to get insight from data. Growth hackers will tend to have digital experience and be able to build and amend websites or digital platforms (like apps) to launch new products, service lines or optimise based on feedback and data. These are for the most part skills that recruitment marketers should learn to remain relevant in this day and age. You may not be able to growth hack recruitment, but you should know about it. For more information on growth hacking read this book. Content is King. We know. We’ve been hearing it for the best part of eight years. But still so many recruitment companies aren’t focusing on creating unique content as part of their strategy. Here are three reasons why it is still important. If Google isn’t one of the top sources of traffic to your business you are probably in trouble. Still in 2017 the best way to rank within the search engines is to create good quality content specific to the search queries your target audience are looking for. So if you are trying to drive applications for “site manager jobs in Plymouth” how well does your site rank for that term? If it doesn’t, then start creating content around each of those key terms and the phrase as a whole. Not fussed about ranking organically? Well if you are investing in pay per click and Google Adwords the more relevant your website content the cheaper it becomes to advertise. Referrals to websites from social media have increased dramatically over the past few years. And this will be the same for your business if you are creating content regularly. When looking to grow followers on social media, creating a reason for these people to come back time after time is key. That reason is content. Check out these key metrics to measure social media. Unless you are the only business doing what you do and your audience has no alternative then you need to convince people to work with you. Content will allow you to convince candidates, clients and future employees that you are the business for them. The best recruitment marketers are those who are able to use content to persuade. Whilst a recruiter can do this on an individual level a marketer can do this at scale. You know content is fundamental to digital marketing so create some today. Looking for ways to start? Check out this framework. You may not have the most influential Twitter account for your particular area of expertise. But scores of people are just clicks away that you can leverage to help boost your brand and your message. All you need to do is find them and ask. Here are five steps to do just that. Start by going to Buzzsumo.com and clicking on the Influencers section. Search for the topic or areas of expertise that are most relevant. Go to Klout.com and sign in. You will be presented with people who are influencers in your space. Then search for the Expert Tags related to topics that are relevant to you. Note that whilst in Buzzsumo you can search for any key words, on Klout you search for tag terms. For example I can search for “recruitment marketing” on Buzzsumo but on Klout I will have to look for the tags “Human Resources” and for “Recruitment and Staffing”. For more information on using your Klout score check out this blog on social media audits. Build a list (either public or private) of these infleuncers on Twitter. This will make it easy to keep tabs on them, the content they share and the conversations they have. Start reTweeting and interacting with these influencers. Hopefully they will recognise you when it comes to contacting them. Pick a piece of content you would like these inlfuencers to share. Reach out to each influencer directly and personally. Whilst contacting them via Twitter is easiest, I would recommend taking more time to craft a compelling message and contact them via LinkedIn, via email (if you can) or via their website / blog. Below gives you direction for wording that message. Like you I am really passionate about XYZ area of expertise. In fact I’ve written a couple of articles on the topic. I’d love you to take a look if you get the chance. Here is a link to the piece that I think is most likely to be of interest to you. I’d love to hear your feedback on it. LINK. If you like it I would be really grateful if you could share it. That would make my day! P.s. Let me know if there is every anything I can do for you. Set up a search for your website domain (or the content you’ve shared) in a tool like Hootsuite or regularly check back on Twitter using a saved search. Be sure to thank everyone who shares your posts and articles. Interact with those Twitter members who have taken an interest by reTweeting or responding to influencer posts of your content. They should be more responsive. Once you are accustomed to interacting with influencers you may wish to track the outcomes they drive. One simple way is to share bit.ly links. You can see how many times those links have been clicked. If the influencer is used to receiving requests to share content they may also be familiar with these types of tracking tools. With bit.ly, when using their logged-in free version, you are able to customise each bit link (such as bit.ly/GiantFinder). If you use Google Analytics try UTM tracking to get a more comprehensive view of what visitors are doing when they are on your site (use a UTM builder to make this easier). See below for an example. If you want to learn more about building UTM tracking into your campaigns check out this by Kissmetrics. Good luck on your influencer marketing efforts! Even the best marketing, PR, advertising and branding professionals neglect their own personal brand. But by ignoring themselves they are missing out on business opportunities, jobs and are building the wrong associations in others’ minds. Take the bull by the horns and make a couple of quick changes to make sure that every interaction with you online is as impactful as possible. Start by thinking about the five key messages or stories that you need to tell. This should be a short introduction to you. It is essential that it is easy to tell across multiple channels and be as relevant on the homepage of your website and LinkedIn page as it is being told by someone else in reference to you. A good profile picture is essential. You are seven times more likely to receive a response to an InMail if you have one. In addition, it helps should you bump into someone at an event or meeting. The style of the picture should reflect how you wish to be perceived. A picture of you down the pub might be the picture you have to hand but that isn’t the lasting impression you want to leave (unless you are a publican of course). What is the purpose of this conversation or this content that you are making me read? What are you trying to achieve? Be up front about your objective. Explain what you stand for. This needs to include your core values and your mission statement as well as what motivates you. Your mission should be more of your “why” and this is more “how” you do your job. Find your USP – your unique selling proposition and explain it to your audience. Instead of just explaining what we are selling you could equally discuss the UBR – the unique buying reason; the reason that people buy instead of the reason we sell. What that means for you. Complete the circle and give case studies and testimonials of how you have helped or impacted others. It is essential that you have success stories that demonstrate how you have achieved your mission through what you do and how you do it. Now take a look at your LinkedIn profile and see how these elements take shape. Use your headline not to show your job title, but instead how you can help other people. This is your succinct Who I Am content. Build out your Summary with your full Who I Am message and then explain Why Am I Here followed by My Mission. Each section of your Experience should explain the My Mission of the company you work for or represent. Then you can go on to explain What I Do highlighting your USPs (or UBRs). If your role involves a process that you take people / businesses through it is wise to document that. Use both the rich media components and Recommendations to show what you have done for others. This is your online portfolio that highlights What This Means For You should someone choose to do business with you. Double check that your contact details are up to date and that it is easy to get in touch. You can add up to three links on your profile – make sure you use them! At the very least link to your company website. A few other options include social media sites, specific areas on your website (such as testimonials or services), your blog or a portfolio. To see an annotated guide check out the slides below. Digital marketing is measurable and you can scale up from a small start. You can test to your hearts’ content. Dip your toe. Try this. Optimise that. Tweak this. Dip your foot. Optimise. Tweak. Try a bit more. When your competitors tested it a while back and are today using it successfully what are you actually “testing”? Are you testing the platform, the product, the channel? Or are you testing your own ability to use them effectively? Digital marketing doesn’t need more testers of the mainstream – especially not in saturated markets. Marketing needs a hero to do it bigger, better and have more impact. So when they are swimming laps and you are still dipping your toe it is unlikely that you are going to win the race. Content: It is important but difficult to pull off. In fact according to research from Hubspot creating content and measuring the return on invest are two of the biggest challenges faced by marketers today. Despite statistics demonstrating that posting and sharing content helps build your brand, drives engagement with your target audience and actually leads to more conversions (applications to jobs or clients getting in touch) the vast majority of recruitment businesses haven’t invested in content marketing training or hired content experts. This is huge lost opportunity. Over the last 12 months my team and I have spent many hours educating our clients on how to make creating content simple. Here I’ll share a couple of tricks which will save you time and effort. So what can you do today to save time, create more content and have an instant impact? It starts with the way your structure your content. Since school we’ve heard about building stories with the right Beginning, Middle and Ending. When it comes to content creation and content marketing think of these three steps as chapters titled Problem, Solution and Resolution. Highlight a problem that your target audience of candidates or clients face. This could be a problem that they are very aware of (how do I prepare for an upcoming interview) or something that is news to them (did you know the job of a marketing director will become redundant because of “Growth Hackers”). Conversations between recruiters and their candidates or clients should raise challenges that these individuals or businesses face. Build a process in your business where marketing and front line recruiters speak regularly to share what the hot topics of the day are. When highlighting problems that your clients and candidates might not be aware of – such as changing market factors which could impact their career progression, or legislation changes which might mean hiring certain candidates becomes difficult – try to add statistics or data from third party sources to validate the issue. Explore what your clients and candidates can do to solve these problems. In the earlier examples this might include a vide tutorial on how to act in an interview and some tips for the most common questions, or training courses and book recommendations for marketers looking to learn about “Growth Hacking”. The more comprehensive your solution, the better you demonstrate how well you understand your business and the market. For years now recruitment consultancies have been talking about the “value added service” which they offer alongside their standard recruitment offering. Here is the opportunity to deliver on that promise. Content with a framework or process which is easy to follow will often be more successful and increase the number of social shares you receive. Having highlighted a problem, explained how it can be fixed you now have an opportunity to share examples of people / businesses who have followed these recommendations to see success. Showing real life examples instantly builds credibility. This is like a case study on what your business has done and therefore what you can do for other clients or candidates. Going back to the earlier examples you might show how someone managed to get their dream job as a result of your interview advice, or how “Growth Hacking” has changed your client’s marketing department. Heck yes! In fact this process is used across case studies, self-help books, adverts and infomercials. Take the recent advert on television from AO. They highlight a problem shared by many parents; children get dirty, and occasionally washing machines break down. Then they describe the solution which involved contacting AO. Finally the entire video is a resolution because it is narrated in the first person by the family involved. In a recent session with clients in the LinkedIn office several recognised this formula from articles they had read or had written themselves unknowingly. Even this blog post takes the format of Problem, Solution, Resolution. Please let me know if you try this formula and if you have success with it. Any feedback is welcome. Sales Vs. Marketing – should you do one without the other? The best recruiters act like marketers. The best marketers act like sales people. The challenge modern businesses face is that whilst the roles of marketing and sales are on their way to converging, the day to day activities each party undertakes are still distant cousins. According to HubSpot the tools that marketers prefer are predominantly inbound lead generators – like social media, whereas sales professionals lean more towards outbound tools – like the telephone and email. Inbound activities such as social media and content marketing are like marketing with a magnet whilst cold calling and untargeted traditional advertising is marketing with a proverbial sledgehammer smashing your prospect over the head with your message regardless of their interest or relevancy. Thoughtful and targeted still works when it comes to advertising and cold calling. Take for instance the practice of calling companies who are posting job adverts; if you are recommending the perfect candidate the client is more likely to listen to you. That is smart and relevant. Your prospect has an obvious business problem which you can fix with your candidate. In the above example I say “more likely” because the fact of the matter is that this prospect has probably had a dozen calls this morning already and two dozen emails with the “perfect candidate” being speculatively pitched. Rather than extol the virtues of inbound marketing and sneering irreverently at telesales professionals I truly believe that both have a place and should work in conjunction for maximum impact. Having started my career making cold calls (a job / challenge that I absolutely loved! ), I believe that there is a still a place for telesales and cold calling. However cold calling without the support of marketing is like bringing a knife to gun fight. One person, one phone, how many calls? It is impossible to make unlimited calls within a finite timeframe, and although training and coaching can help people to hone the skills of a sales person on each call it is still a lot of investment with a variable return. Whilst I would never say that marketing generates 100% returns I will say that the equation of sales and marketing working together is better than the sum of their parts. Sales + Marketing = <Sales only OR <Marketing only. Mr. Brailsford was on to something. The fact his cycling teams won 59 World Championships and multiple gold medals at the Olympics was no fluke. Make everything you do more effective and your business will be more successful. Training makes each call better. Good call lists and research make every call more relevant. Fantastic candidates to pitch increase the likelihood of a close. Warmed-up contacts who have been marketed to make for better calls and conversations. An inbound lead makes for the quickest of turnarounds. In the same way that untargeted calls get little return it makes sense to have a targeted approach to marketing. Focus your energies and resources on a specific audience which is manageable (by manageable I mean reasonable within the means of your time, budget and skills). Select the audience you want to influence and begin to market to them. Business courses and marketing qualifications talk about the “buyers journey”,” sales funnel” or “marketing funnel”. Familiarise yourself with it. Understand who needs to see your business and start to build up awareness with this target audience, deliver a message that makes them consider you and your services. If that message is good enough and resonates that target audience will start to generate a preference or bias towards you compared to other businesses and competitors. At that point you may well drive conversions directly through inbound leads, but equally you should be targeting these people with traditional sales methods like telesales. Calls to a warmed up audience are substantially more likely to drive returns. According to the Harvard Business Review 57% of a decision to buy from a business happens before contact with a sales person. That top of the funnel marketing activity dictates the success at the bottom of the funnel. Killing the cold call starts when you warm up the audience with marketing. A colleague of mine worked for a well-known recruitment agency (the one where everyone wears blue suits and brown shoe wearers would historically be sent home to find more appropriate attire). In his years at this agency he never once made a cold call. The reason being that every person he interacted with already knew the business, the brand and had made their mind up if they were good or not. The quality of the recruiter rarely came into question as quality was assumed based on the brand’s reputation in the market. When this colleague moved to a start-up he finally learnt what cold calling was. Introducing a new business or a new concept is hard when your target audience has no frame of reference to work with. If you ask him where he preferred working he can’t deny that life was easier at the well-known agency. Make your life easy. Be a well-know agency. Start marketing now.